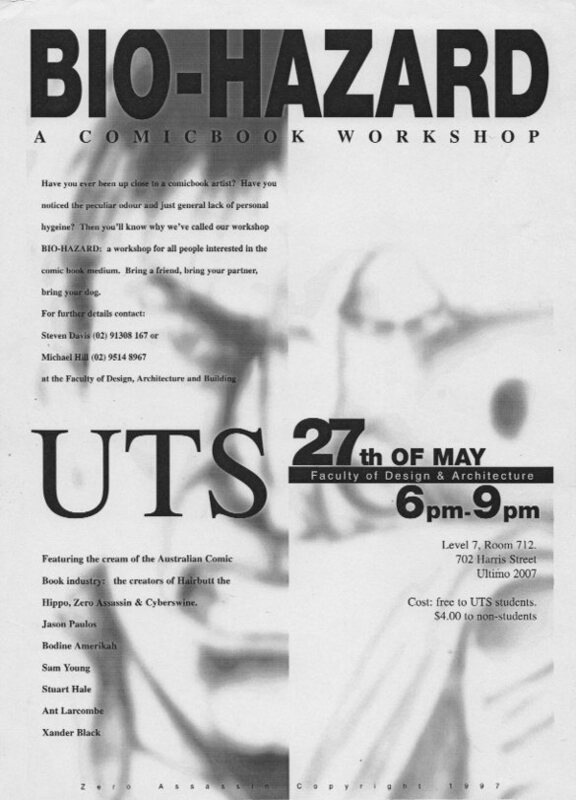 Back in the 1990s a small number of design students enrolled at Sydney’s University of Technology were fortunate to attend two comics workshops taught by local creators Jason Paulos, Bodine Amerikah, Stuart Hale, Ant Larcombe, Sam Young and Xander Black. The events were organised by the students. Working in the Visual Communication Design program at the time, the course from which one of the creators, Ant Larcombe, was a graduate, I was happy to act as go-between and coordinator of this student initiative. 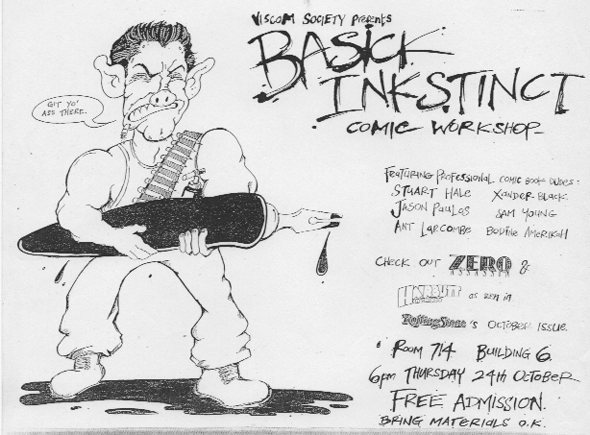 The first workshop was Basick Inkstinct in 1996. This was followed up and developed the following year with the same tutors under the title Bio-Hazard. Both workshops enabled students to have contact with industry practitioners, creators and publishers of titles such as Hairbutt the Hippo, Cyberswine and Zero Assassin. This type of contact can make a valuable contribution to student training. It permitted students to see comics production as a valid form of visual communication within the graphic design field, a course that the majority of those who attended were enrolled. Both workshops were informally structured with the creators sitting at tables with the students demonstrating their skills on paper and engaging in studio banter with each other as they drew. Stuart Hale and Xander Black gave brief talks about comics making and the relative merits of local creators before the comics artists went through a practical session of scripting, thumbnails, page layout, rough and refined pencils, lettering and inking. The visiting creators were very generous with their time and the students appreciated this. These workshops preceded a more formal and official event that I subsequently organised, namely the Mind Rot Australian Comics Seminar & Workshop that I have blogged about previously in this series. That more formal workshop and accompanying symposium represented a further step in the process of formally recognising comics design within the academic curriculum as I was eventually able to offer comics based projects in the subjects Word and Image and Graphic Visualisation in that course and in the Master of Animation course that followed some years later. This is the eleventh in a series of posts called Archives of Australian Comics History that document moments in the recent history of Australian comics, particularly alternative comics and the Australian Small Press. I started researching this subject in the late 1990s and it eventually led to my PhD thesis: Ph.D. Macquarie University, Division of Society, Culture, Media and Philosophy, A Study Of Contemporary Australian Alternative Comics 1992-2000 With Particular Reference To The Work Of Naylor, Smith, Danko And Ord, 2003. On completion of the research I donated the materials and comics I had collected to the National Library of Australia: Michael Hill Collection of Australian Comics. This entry was posted in Archive of Australian Alternative Comics, Art, Comics and tagged Ant Larcombe, Bodine Amerikah, Cyberswine, Jason Paulos, Michael Hill, Neil Heymann, Sam Young, Stuart Hale, visual communication, Xander Black by Doctor Comics. Bookmark the permalink.